The Great Ghost Fence (usually shortened to simply 'the Ghostfence') is an enormous shield-like wall surrounding the crater of Red Mountain. Developed to keep the Blight and Corprus monsters contained within the Red Mountain Region, it is sustained by the Tribunal's combined powers. If it did not exist, it is reasonable to assume that the Blight and Corprus would have reached all areas of Vvardenfell. It was constructed in a similar style to that of standard Temple architecture. Its pillars are able to channel the holy energies of the Tribunal and the spirits of the deceased, converting them into a great impenetrable shield. Except for the tunnel through Kogoruhn, the only entrance to the Red Mountain Region is at Ghostgate, although it is possible to levitate over the fence, and cliff racers are able to fly over it. Following his reawakening in 2E 882, Dagoth Ur bound himself to the Heart of Lorkhan, the source of the Tribunal's power, and started a theocracy in Morrowind based on the worship of the new-born god Akulakhan. Later that same year, Dagoth Ur and his ash vampires ambushed the Tribunal during their annual ritual of bathing in the heart's power, driving them away and preventing them from restoring themselves with Kagrenac's tools. 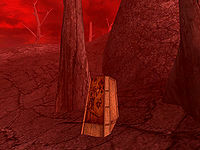 In the years that followed, while Dagoth Ur attempted to spread Corprus disease and the Blight throughout Vvardenfell from his fortress in the crater of Red Mountain, the Tribunal launched intermittent campaigns against the fortress, seeking to force access to the Heart Chamber. While some of these campaigns were successful, and Dagoth Ur and his kin were slain, the Heart always revived them in time. When the Tribunal realized that they couldn't destroy him, they created the Ghostfence to contain the threat. They also erected the Ghostgate so that they and others would have access to Red Mountain. They stationed Ordinators of House Indoril and Buoyant Armigers to guard the gate. Unfortunately, the Tribunal were required to constantly focus a portion of their power on the fence to sustain it. The Tribunal's power was severely weakened in 3E 417 after Dagoth Ur managed to capture two of Kagrenac's tools, Keening and Sunder. Combined with the increasing effort required to sustain the Ghostfence, all three Tribunes have become increasingly reclusive. Vivec had been a very public figure in Morrowind until this event. According to Ancestors and the Dunmer, the Tribunal incorporated the bones of many Dunmeri ancestors into the Ghostfence. The Temple discouraged private or clan burials as selfish, with the result that the vast majority of ancestors' remains were used to strengthen the Ghostfence instead. This may be one example of how the Tribunal and the Temple altered traditional religious and burial practices as part of their fight against Dagoth Ur. 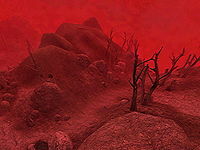 Following the downfall of Dagoth Ur, Red Mountain stopped spreading the Blight, and conditions in the area were much the same as the rest of Vvardenfell. The Ghostfence itself remains; however, the shield that it once produced has become unnecessary, and has therefore been deactivated. 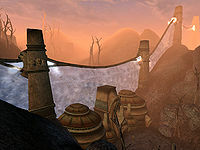 Ghostgate has not been retired—it and the Ghostfence's structure remain as a reminder of the Nerevarine and the defeat of Dagoth Ur. Ghostgate now serves as a rest for Pilgrims wishing to visit the Shrine of Pride and travelers passing through the area. Outside the fence, it is placid and calm like any other place in the Ashlands. Inside, however, can be described as a hellish nightmare. The dreaded Blight constantly emanating from the crater of Red Mountain appears as a thick, blood red haze, similar in appearance to an Ashstorm. In addition, the sky appears completely different with thick, heavy clouds driven by exceptionally high winds. The landscape is dotted with numerous ancient Dwemer facilities. Since the disappearance of the Dwemer, these facilities serve as bases for Ash Vampires and, most notably, Dagoth Ur himself. These facilities were formerly known by their Dwemeri names. Now, they are referred to by the names of their inhabitants such as Vemynal, named after the Ash Vampire Vemyn. Due to the effects of the Blight, Corprus monsters and assorted Blighted creatures reside within the fence. It is exceedingly dangerous to wander inside the fence. The most widely known way into the Ghostfence is by way of the gate at Ghostgate. This can be activated by a switch adjacent to the fence. Aside from the odd adventurer, the only people who enter the Ghostfence are Pilgrims of the Temple who wish to visit the Shrine of Pride. It is advised by the Temple that one should be relatively safe from the denizens of the area by simply fleeing at the first sign of trouble. This can be taken as an extreme under-estimation on the Temple's behalf and many Pilgrims choose to hire escorts to follow them into the Ghostfence for protection. The fence, although impenetrable, has been known to have been breached on several occasions. There are alternate routes into and out of the fence speckled throughout Vvardenfell that Sixth House cultists and assorted kin of Dagoth Ur have used to escape. For example, the Sixth House tunneled under the Ghostfence and into their old stronghold of Kogoruhn in 3E 400. Assorted Ordinators and Buoyant Armigers have also suggested that many monsters such as Corprus beasts have escaped the Ghostfence in an unknown fashion and had to have been hunted down and killed. This page was last modified on 9 March 2017, at 15:35.